We’d love your help. Let us know what’s wrong with this preview of Inequality by Anthony B. Atkinson. Inequality is one of our most urgent social problems. Curbed in the decades after World War II, it has recently returned with a vengeance. We all know the scale of the problem--talk about the 99% and the 1% is entrenched in public debate--but there has been little discussion of what we can do but despair. According to the distinguished economist Anthony Atkinson, however, we can do much more than skeptics imagine. "[Atkinson] sets forth a list of concrete, innovative, and persuasive proposals meant to show that alternatives still exist, that the battle for social progress and equality must reclaim its legitimacy, here and now... Witty, elegant, profound, this book should be read." "An uncomfortable affront to our reigning triumphalists. [Atkinson's] premise is straightforward: inequality is not unavoidable, a fact of life like the weather, but the product of conscious human behavior. To ask other readers questions about Inequality, please sign up. The topic of social inequality has been widely discussed in certain policy circles even before the publication of Capital in the Twenty-First Century in 2013. Piketty takes a longer historical view of the phenomenon, and takes a pessimistic view of its historical inevitability. Atkinson, one of the main figures in the field of inequality economics, takes a different approach to the questions of inequality. He does not view it as a continuous historical process, but a series of episodes. He compa The topic of social inequality has been widely discussed in certain policy circles even before the publication of Capital in the Twenty-First Century in 2013. Piketty takes a longer historical view of the phenomenon, and takes a pessimistic view of its historical inevitability. Atkinson, one of the main figures in the field of inequality economics, takes a different approach to the questions of inequality. He does not view it as a continuous historical process, but a series of episodes. He compares the period between 1945-1970 as a general decline in inequality, and the decades since 1980 as an 'inequality turn'. Inequality is not a single or simple thing - he makes a crucial distinction between individual 'earnings dispersion' and household income inequality. Furthermore, it is the specific result of policy decisions, which can be reversed. After descrbing his conditions, Atkinson makes his case in fifteen policy proposals. These include, but are not limited to, government 'direction' of aiding technological change, encouraging trade unions as a counterbalance against corporate overreach, explicit unemployment targets, a living wage, a guaranteed positive interest rate on savings (with a maximum holding per person), a capital endowment on age of adulthood, a sovereign wealth fund, a progressive income and property tax rate, strengthened social insurance schemes, and so on. There are also questions for further analysis, which include an annual wealth tax, or a global tax regime for personal taxpayers to avoid tax evasion, and a minimum tax for corporations. Although this policy analysis is UK-centric, it's astonishing how much of these could be directly applied to other policy situations. It's astonishing how few of these are beyond the pale of discussion - or at least were before the 'inequality turn' of 1980, where balanced budgets and competition were among the very few allowed topics for debate. Atkinson also discusses the most common counterarguments against these types of proposals - that they would limit economic growth, that they would make a nation less competitive in a more globalized economy, and the government could not afford them. Inequality: What can be done? by Anthony B. Atkinson, is a fascinating book that examines basic policy prescriptions to reduce inequality levels and improve close the wage distribution gap that many nations currently feature. Atkinson begins the book by examining inequality levels over the past century, using primarily data from the US and UK as a comparison, but also looking globally when needed to make his statistics more authoritative. He finds that income inequality has a U shaped curve - in Inequality: What can be done? by Anthony B. Atkinson, is a fascinating book that examines basic policy prescriptions to reduce inequality levels and improve close the wage distribution gap that many nations currently feature. Atkinson begins the book by examining inequality levels over the past century, using primarily data from the US and UK as a comparison, but also looking globally when needed to make his statistics more authoritative. He finds that income inequality has a U shaped curve - in the early 20th century, income was generally quite unequal, with wealth being concentrated in the hands of wealthy citizens in a society. As WWII ended, this trend began to decline, and many nations have seen there income levels reach the fairest possible ratio they have ever achieved in the years leading up to and including the 1960's. This trend has again reversed, and we are approaching global levels of income inequality not seen for a century. Atkinson has used many metrics to show this trend, some of the more frequently used ones being the Gini coefficient as well as household income distribution calculations that include income from wages and capital, and subtracts taxes. These metrics are useful in bringing a statistical backing to the introductory analysis of historical inequality. 1. Government oversight of technological development so that innovation is always geared toward increasing employment rates. 2. Ensuring a proper balance of power exists among stakeholders - this includes balancing the power of business leaders, the government and workers/trade unions in terms of employment decisions, and creating or improving the power of consumer groups to encourage businesses to think about consumers over shareholders. 4. A national pay policy should exist to produce a minimum wage that ensures a livable wage. Atkinson also believes that this should be a top priority for national governments. 5. A guaranteed positive real rate of interest on savings via national savings bonds. 6. A capital endowment (minimum inheritance) paid to all at adulthood. 7. The creation of a sovereign wealth fund to build up the net worth of the state by purchasing property and investing in businesses. 8. A more progressive income tax rate that has a varied impact based on ones income level. Basically higher taxes for higher income, lower taxes for lower income. 9. The introduction of an Earned Income Discount tied into the number of dependents in a household. 10. The taxation of inheritance and gifts under a progressive lifetime capital receipts tax. 11. Up-dating property tax registers regularly to ensure proper payment of taxes. 12. Child benefits should be paid to all children at a substantial rate, but should be taxed. 13. A "participation income" (a form of guaranteed annual income) to complement existing social protection policies with the aim of a national child basic income. 14. (alternative to the above) An update to national social insurance policies to ensure they are up to date and can support the economic development of lower income earners. 15. The increase of Official Development Assistance to 1% of gross GDP. As can be seen, Atkinson is exploring some ideas about improving household income. He suggests improving levels of equality by giving social assistance to low income earners, progressively taxing the rich, taxing forms of capital transfer to level the playing field, and giving taxable benefits to those households with dependents. Although these policies seem radical (Atkinson mentions they might) I personally think they are quite fascinating. Without going into to much detail, these policies expand the role the state has in redistributing income, with the ultimate goal of improving the general level of prosperity in a nation state. Atkinson's 15 proposals are expanded in greater detail, getting a full chapter each. This ensures that the summations are explained with statistical backing, as well as the ethical reasons why they should be explored. Obviously these prescriptions are political in nature, and may anger some more ideological readers. However, looking at them with no preconceived notions is important - this is good political discourse here, and it is grounded firmly in reality. Atkinson goes on to ponder the plausibility of enacting these proposals, and wonders whether globalization will be a help, of a hinder. Se trata de una versión más corta, menos técnica, más aburrida y más inglesa de Capital in the Twenty-First Century. Creo que le pifié al ponerme a leerlo todo. Me pasa un poco eso, no logro identificar que no es necesario leer todo un libro para saber de que va, y que es imposible leer todos los libros. Me interesaba algo en la línea de Desigualdad: este libro lo cita al principio, pero no va más allá de eso. También menciona la discusión que me interesa con Rawls a la cabeza, pero se vuelve Se trata de una versión más corta, menos técnica, más aburrida y más inglesa de Capital in the Twenty-First Century. Creo que le pifié al ponerme a leerlo todo. Me pasa un poco eso, no logro identificar que no es necesario leer todo un libro para saber de que va, y que es imposible leer todos los libros. Me interesaba algo en la línea de Desigualdad: este libro lo cita al principio, pero no va más allá de eso. También menciona la discusión que me interesa con Rawls a la cabeza, pero se vuelve a quedar ahí. Dice que Piketty menosprecia el papel del estado. Para mí no es así. Plantea que de acuerdo a Piketty la única manera de reducir la desigualdad es una guerra. Yo en cambió entendí que esa fue la manera en que sucedió en el pasado, pero Piketty insiste en soluciones estatales al problema de la desigualdad. Una tasa Tobin, por ejemplo. En este libro Atkinson propone otras muchas soluciones posibles, impuestos y subsidios básicamente. Creo que eso es lo más interesante del libro. Es decir, no la discusión teórica sino las propuestas "prácticas". Muy orientadas a la coyuntura Inglesa de hace tres años (al menos lo leí bastante "a tempo"... da la sensación que este libro se torna ilegible después del 2020). Dice que Piketty se centra exclusivamente en Francia. Para mí no es tan así. Me aburrió bastante y no me aportó nada demasiado nuevo. Me pareció que le falta discusión política sobre la implementación de las propuestas. En sudamérica las cosas cambiaron mucho en los últimos tres años respecto de las políticas tan alabadas en este libro. ¿Por qué se "corruptizan" las instituciones públicas? ¿Cómo hacer para evitar ese proceso? En el prólogo menciona la cuestión de la diferencia entre la desigualdad "merecida" y la "inmerecida". Es lógico pensar que la sociedad compense economicamente a quienes más se esfuerzan estudiando y trabajando. También tiene sentido que uno pueda hacer una transmisión de riqueza a su descendencia. También queda claro que los niveles de desigualdad en los que vivimos son intolerables. Para convencerse de esto, haga lo siguiente: entre en una página de venta de inmuebles de su ciudad y busque casas ordenadas de mayor a menor precio. Incluso sacando los precios irreales se dará cuenta que nadie puede comprar una casa de tres millones de dólares a fuerza a ahorrar de su salario. Solo mantener una casa así sale al menos lo mismo que lo que gana una persona bien paga. Si vive en una ciudad también habrá advertido que hay gente que duerme en la calle. ¿Cómo es posible que las sociedades toleren esto? Ahora bien, creo que la cuestión está en como lograr sociedades más justas, no solo más equitativas. La desigualdad es mala "per se", estoy de acuerdo con Atkinson. ¿Pero como hacer para que el esfuerzo valga la pena? Sería preferible vivir en una sociedad donde todos tengan donde vivir y que comer. Al menos eso. También la posibilidad de acceso a la educación. ¿Qué premiamos como sociedad? A un buen futbolista lo premiamos con un sueldo que alcanzaría para satisfacer necesidades básicas (dependiendo del lugar, obviamente) de (tranquilamente) diez mil personas. Eso es jugar al fútbol, si dirigís una empresa ganas mucho más. ¡Y eso es salario! Obviamente la plata no se hace trabajando, sino con tierra y capital, o alguna buena idea digamos. Creo que está bien que el capital produzca una ganancia, también el esfuerzo y la responsabilidad. Pero estoy seguro que estos diferenciales no son los que optimizan la retribución al esfuerzo y la responsabilidad. En primer lugar porque alguien que no comió bien y durmió en la calle de chico no puede ni pensar en esforzarse y ser responsable. Creo que esta cuestión de la correcta asignación de retribuciones a las ideas, al capital, al esfuerzo, a la responsabilidad, etc. es más interesante que la desigualdad "per se". Y creo que Atkinson la pasa de largo. Todo chico merece al menos la posibilidad de crecer y estudiar, estoy de acuerdo con esa propuesta del libro. También con que por el intercambio generacional todos deberíamos heredar al menos algo. Pero creo que el camino del "tengo derecho a esto" es, al menos, peligroso. If there is anyone who has the credibility to hold forth on both the plague of inequality as well as its obliteration, it is Anthony Atkinson. Having dedicated a significant part of his career to the cause and consequence of inequality, Anthony Atkinson is a treasure trove of ideas, suggestions, measures and recommendations. He puts all these valuable attributes to splendid effect in "Inequality: What Can Be Done?". Beginning by providing an overview of the pernicious problem that is inequality, If there is anyone who has the credibility to hold forth on both the plague of inequality as well as its obliteration, it is Anthony Atkinson. Having dedicated a significant part of his career to the cause and consequence of inequality, Anthony Atkinson is a treasure trove of ideas, suggestions, measures and recommendations. He puts all these valuable attributes to splendid effect in "Inequality: What Can Be Done?". 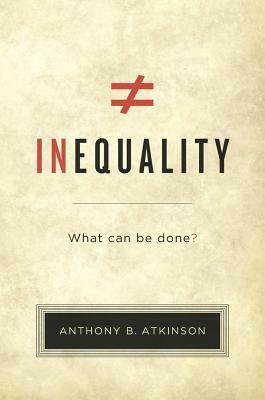 Beginning by providing an overview of the pernicious problem that is inequality, Atkinson proceeds to elucidate 15 proposals; a stirring mix of both the tried and tested as well as innovative which in his opinion would go a long way in mitigating inequality, if not obliterating it. These proposals include channeling the potential of technology with a humane objective in mind whereby the spur of advancement will act as a generator of employment rather than displacing labour; every country contributing 1% of its Gross National Income ("GNI") towards a corpus for poverty eradication; increasing the marginal rates of taxation to as high as 65% (a proposal that is sure to rankle very many sentiments); a compulsory entitlement towards Child Benefit as well as an employment allowance to every adult etc. As may be evident from the nature of the proposals themselves, they are controversial as well as debate inducing. Recognising this fact, Atkinson devotes an entire chapter in discussing the potential criticisms that could be levied against each of the fifteen proposals as well as comprehensive rebuttals of such criticisms. He also dwells on the budgetary aspects of the proposal concluding that a state bold enough to introduce and implement such proposals, although incurring huge expenditure will still end up clocking a surplus. While at heart a good book, its written in that academic purple prose style that made Capital in the Twenty-First Century such a slog. I suppose this must be expected of any economics text, I have read very few that aren't heavily padded. It looses a star for writing style. At the heart of this book is Atkinson's 15 proposals designed to reverse this rising inequality that started in the early 80's. Let's look at Proposal 6: There should be a capital endowment (minimum inheritance) paid to all at While at heart a good book, its written in that academic purple prose style that made Capital in the Twenty-First Century such a slog. I suppose this must be expected of any economics text, I have read very few that aren't heavily padded. It looses a star for writing style. Let's look at Proposal 6: There should be a capital endowment (minimum inheritance) paid to all at adulthood. This could be used to fund college or vocational training, buy a house or start a business. This would fix some of the issues with higher education including the roughly 70x increase in tuition for California State Colleges and help those not college bound in other ways. Of course in the book this is covered with more details and verbage. And when the neo-cons cry not possible, I would counter that other countries have done some of this already, including the US pre-80's and that high levels of inequality lead to political instability. I wouldn't want to be a member of the ultra-rich if they brought back the guillotine. For the average Joe I would point to Denmark's happy residents that enjoy a decent social support network, good economy and low crime as something the US should strive for. Este es un libro - ensayo de economía de nivel básico-intermedio. El libro esta dividido en dos partes. En la primera, explica conceptos básicos y la evolución de la desigualdad en el mundo. En la segunda parte elabora una serie de propuestas de política económica e ideas a explorar para reducir la desigualdad, enfatizando en el Reino Unido. Al mismo tiempo, también escribe un capítulo para dar respuesta a las posibles críticas a dichas propuestas. Por ejemplo, un mito típico es que algunas medi Este es un libro - ensayo de economía de nivel básico-intermedio. El libro esta dividido en dos partes. En la primera, explica conceptos básicos y la evolución de la desigualdad en el mundo. En la segunda parte elabora una serie de propuestas de política económica e ideas a explorar para reducir la desigualdad, enfatizando en el Reino Unido. Al mismo tiempo, también escribe un capítulo para dar respuesta a las posibles críticas a dichas propuestas. Por ejemplo, un mito típico es que algunas medidas para disminuir la desigualdad podrían detener el crecimiento económico, cuándo no hay evidencia para sostener eso. Como tampoco hay evidencia para decir que la globalización impide reducir la desigualdad. Si bien el libro esta enfocado en el Reino Unido, varias políticas son transferibles a otros contextos o permiten analizar las existentes con un enfoque para reducir la desigualdad. Un libro recomendable para los interesados en analizar la desigualdad económica y cómo reducirla. Anthony Atkinson's Inequality is a dense book probably aimed at people who are much smarter than I am. But it's nonetheless easy to grasp the basic ideas. Atkinson talks about the extreme degree in which the developed world faces income inequality and practical ways to rectify that inequality. Essentially, what he thinks is that the problem requires a patchwork of solutions or a package of policies that all have to be implemented in concert with one another. For example, one decent thing that co Anthony Atkinson's Inequality is a dense book probably aimed at people who are much smarter than I am. But it's nonetheless easy to grasp the basic ideas. Atkinson talks about the extreme degree in which the developed world faces income inequality and practical ways to rectify that inequality. Essentially, what he thinks is that the problem requires a patchwork of solutions or a package of policies that all have to be implemented in concert with one another. For example, one decent thing that could be done would be to increase the minimum wage to a decent living wage, and maybe to allow wage hikes in general. Sad fact is is that average wages have not seen a real increase in at least 40-some-odd years so it would be nice if the salaries increased along with the necessary standard of living. Another solution would be increasing the amount of money that people receive with the Earned Income Tax Credit (EITC). The EITC is a system already in place in the United States whereby households get back money after they pay into taxes if their in a low enough income bracket. Already this has been estimated by the federal government to keep many families and children up out of poverty. It could only help more to increase this amount. Another policy change: At least in the United States, there is not much in the way of protection for workers' rights vis-a-vis employers, so minimal or zilch restriction on the formation of unions would be a nice thing. (Wal-Mart, for example, has threatened to fire employees if the company so much as gets wind that you're interested in forming a union.) I can't remember all his other proposals (there are about 40) but here's one last one I can remember: Governments should make a concerted effort to direct the technology they fund for research so as to direct it to better people's livelihoods. In general, this has not been the case. The Internet, for example, was an invention of the Pentagon system and then only later privatized for public use. Examples abound like this in the United States, where the top research and development goes into the Pentagon system, eventually becomes privatized, and then people put it out there as products or services for the people. But none of this is being done in a systematic way. The first priority here seems to be to fund military research and then if it happens to have any kind of practical application later, then that's just a nice byproduct. Este es quizá uno de los mejores libros de economía que he leído. El libro de Atkinson es una mezcla poco común de análisis económico riguroso, capacidad pedagógica en la exposición de los argumentos y uso adecuado de datos y estadísticas. El libro busca responder la pregunta ¿qué hacer para disminuir la desigualdad? y es por ello que puede ser visto como un complemento al texto de Piketty. En la primera parte del libro Atkinson explica las razones por las cuales es posible considerar la disminu Este es quizá uno de los mejores libros de economía que he leído. El libro de Atkinson es una mezcla poco común de análisis económico riguroso, capacidad pedagógica en la exposición de los argumentos y uso adecuado de datos y estadísticas. El libro busca responder la pregunta ¿qué hacer para disminuir la desigualdad? y es por ello que puede ser visto como un complemento al texto de Piketty. En la primera parte del libro Atkinson explica las razones por las cuales es posible considerar la disminución de la desigualdad como un objetivo de política loable. En esa misma parte, el autor explica de qué hablamos cuando hablamos de desigualdad, como se mide y da un breve repaso a la evolución histórica reciente de la desigualdad en los países desarrollados. La segunda parte, que es en donde está lo jugoso del libro, está dedicada a la exposición detallada de las 15 propuestas de política de Atkinson para disminuir la desigualdad. Las propuestas son poco convencionales, en buena medida porque de forma correcta abordan al problema de la desigualdad como un problema surgido de diferentes mercados. Cada propuesta es explicada a detalle y se ejemplifica su instrumentación para el caso de Reino Unido. La tercera parte del libro consta de las respuestas de Atkinson a los cuestionamientos más comunes que se le pueden hacer a sus propuestas. Atkinson has contributed an important book that adds a lot to the discussion on the issues raised in Piketty's Capital in the 21st Century. Taking as given the notion that one would like to redistribute wealth and income more equally, he takes up the question of how to go about it. The point of view is an eye-opener for someone used to American political discourse: neither "redistribution" nor "welfare state" seem to carry any pejorative connotation. While the discussion is often specific to the Atkinson has contributed an important book that adds a lot to the discussion on the issues raised in Piketty's Capital in the 21st Century. Taking as given the notion that one would like to redistribute wealth and income more equally, he takes up the question of how to go about it. I would have given this book five stars but for a glaring omision. Professor Atkinson very clearly gives his reasons for income equality in the UK and makes cogent proposals for alleviating the inequality. But he has totally neglected to mention the role of banks in helping create income equality. Especially the way banks pump excessive credit to household and inflate unsustainable bubbles in housing and other assets. Other than that; it is a very comprehensive book with solid proposal to reduce I would have given this book five stars but for a glaring omision. Professor Atkinson very clearly gives his reasons for income equality in the UK and makes cogent proposals for alleviating the inequality. But he has totally neglected to mention the role of banks in helping create income equality. Especially the way banks pump excessive credit to household and inflate unsustainable bubbles in housing and other assets. Wow! This book is an intellectual tour de force. The author covers a vast amount of ground in amazing detail. I like the author's proposal for eradicate inequality. They are more realistic, I think, than Picketty's prescription of a global wealth tax and could be achieved if governments are willing and able. Takes the topic further by introducing tangible proposals to tackle the problem of inequality. Anyone interested in the subject matter or interested in policy in general should study this. Atkinson is a British academic who has co-authored some works with the French economist Thomas Piketty. "Inequality," published in 2015, before the fiasco that has currently overtaken the U.S. and the idiocy of Brexit, offers a number of possible steps that could be taken to limit the economic inequality that exists in western European countries and the U.S. The one problem that I have with the book is that Atkinson doesn't explicit illustrate the economic problem with widening inequality. We re Atkinson is a British academic who has co-authored some works with the French economist Thomas Piketty. "Inequality," published in 2015, before the fiasco that has currently overtaken the U.S. and the idiocy of Brexit, offers a number of possible steps that could be taken to limit the economic inequality that exists in western European countries and the U.S. The book brings light to a very important issue in the modern economy: the inequality and the problems that it creates to the society. - An annual income tax at 65% would make people avoid keep savings. They would earn the money and spend it all. I could list many propositions and its flaws, so I think it is easier to say t The book brings light to a very important issue in the modern economy: the inequality and the problems that it creates to the society. I could list many propositions and its flaws, so I think it is easier to say that the author has a completely different bias than me. I don't believe that the politicians should decide every move allowed to the population. This is a very valuable deep dive into the social impact of inequality and what might be done about it. There are plenty of solutions proposed which are interesting to think about. Sadly they are almost all policy / political in nature and it seems unlikely that many of them are going to be adopted in the current climate. That doesn't make them invalid (though I'm not sure they are all as sound as each other), but they aren't likely to be accessible as near-term solutions for many nations. Great book, I only wish I'd read it sooner. Extremely important ideas and proposals, still salient, to reduce inequality. Despite their radicalism the author supports his points very well and doesn't stray too far from orthodoxy (and when he does, it's usually insightful). Some of the explanations can be quite technical and dry at times, I would suggest skipping past sections that are of less interest. The book feels too heavy for non-economists and somewhat shallow for true specialist . But I appreciate the solid research, and the instrumental and intrinsic reasons against inequality. Also it's sad to see how the Western world (UK & US) moving in opposite direction as the book suggests. Unlike the author, I'm pessimistic about the situation. It is a very interesting book. It develops its thoughts in a very well organized way. Very clear! However, the last chapters work only the British case, and thus are less important for the non British readers. Nevertheless, I highly reccomend this book for those interested on the topic. Overall just a little too academic and "ivory tower"-ish for my taste. I'd have liked to have seen more analysis on the effects the proposals would have and rather less on the rationale for each proposal. Un excelente reflexión sobre las alternativas para luchar con la desigualdad y repensar los esquemas de redistribución de la riqueza. The proposed (mostly taxation schemes) interventions are so complicated as to be absurdly impractical. There is otherwise a good bit of provocative content. Atkinson gives some concrete ideas about things that have to be done, but I am not completely convinced and there are issues I wish he'd addressed more, like global inequality. Would have been better with a bit more math, and the economic theories he uses explained more. Overall a bit dry. “Disuguaglianza – Che cosa si può fare?”, titolo originale: “Inequality. What can be done?” Anthony B. Atkinson, traduzione di Virginio B. Sala, editore Raffaello Cortina, ISBN: 978-88-6030-788-0. La disuguaglianza di reddito e di opportunità, dopo un periodo di calo relativo avvenuto per buona parte del novecento è di nuovo in crescita quasi dappertutto. La svolta, nei paesi industrializzati è avvenuta, un po’ ovunque, a partire dagli anni ottanta del medesimo secolo e a partire da allora, il fenomeno appare inarrestabile e quasi “naturale” perché ritenuto intrinsecamente legato alla globalizzazione. La crescente polarizzazione della ricchezza è ormai un fattore ampiamente visibile e misurabile attraverso indicatori specifici quali il noto e forse abusato coefficiente di Gini. Questo fenomeno è pertanto oggetto di ampi dibattiti politici, non solo relativamente al tema scontato dell’equità, ma soprattutto, perché non sono pochi quelli che ne temono le ripercussioni negative sulla vita democratica e sulla stabilità e coesione delle nostre società civili. Nel corso dell’opera, l’Autore sviluppa un’analisi pragmatica e intelligente che, unisce sia aspetti teorici, sia proposte pratiche e che, in un certo senso, si integra alla perfezione con un altro saggio di recente grande successo mediatico, “Il capitale nel XXI° secolo” di Thomas Piketty. Atkinson mette insieme una precisa analisi storica e statistica dei fattori che hanno inciso e possono modificare il livello della diseguaglianza e cerca di dimostrare, secondo il mio parere, con successo, che la montante sperequazione non è un fenomeno ineluttabile legato a fattori esogeni incontrastabili. Secondo l’Autore ad essa ci si può e ci si deve opporre, e tale risultato può essere ottenuto attraverso l’applicazione di specifiche politiche redistributive. Buona parte del saggio è quindi dedicato ad illustrarne alcune attraverso una precisa ricetta di politica socio-economica costituita da una serie di proposte, soprattutto di natura fiscale, tra di esse interdipendenti ma non necessariamente da applicare “in toto”. Devo ammettere che non tutte mi hanno pienamente convinto, ma aggiungo che, nel complesso, mi sono, invece trovato d’accordo con il quadro generale, le tesi e gli obiettivi espressi dall’Autore. Wait, not the book, but the fact that some have much more than others and that it is truly impossible to justify that in terms of hard work - whatever that means. Inequality has been the elephant in the room that was ignored for so long until Piketty blew up for some reason last year. It's weird how that happens in the culture. I bought Piketty’s book Capital on pre-order and only got about 100 pages in,. By the time I actually got the book, I had read so many blogs going back Inequality is bad. Inequality has been the elephant in the room that was ignored for so long until Piketty blew up for some reason last year. It's weird how that happens in the culture. I bought Piketty’s book Capital on pre-order and only got about 100 pages in,. By the time I actually got the book, I had read so many blogs going back and forth over it that I had felt like I had already read it. This is a very good book but a talented and sound economist of the subject of present-day trends in inequality. It is both diagnostic and prescriptive. Atkinson writes with great clarity. Discussions of survey techniques and the sources of data, their strengths and weaknesses, which you would think would make your eyes glaze over, are downright interesting, at least to me. There is no single source from which present day inequality trends flow. That makes sense. And there is no single solution, no This is a very good book but a talented and sound economist of the subject of present-day trends in inequality. It is both diagnostic and prescriptive. Atkinson writes with great clarity. Discussions of survey techniques and the sources of data, their strengths and weaknesses, which you would think would make your eyes glaze over, are downright interesting, at least to me. And there is no single solution, no one policy mechanism that will provide the answer. And there is no optimal position, no will goose chase for the right gini coefficient. There is the value judgement, which again seems sensible, that where things stand today, is that we will be better off if we take steps to reduce inequality. Where I don't buy in entirely is Atkinson's enormous optimism in the capacity of government to do the right thing. He acknowledges that active statist policies have not always worked out well and government can make mistakes. But he's keen for government to acquire assets that now are in the private sector. He seems to dislike the sell off of public housing to the occupants; however house proud and independent they may have become, they have benefitted at the expense of the public sector. Government can set the direction of technological change, for the greater good, through its guidance of R&D spending and its own activities. Parliaments, apparently, aren't sufficiently democratic. They ought to be supplemented by corporatist entities including trade unions and NGOs that would, somehow or other have real clout.